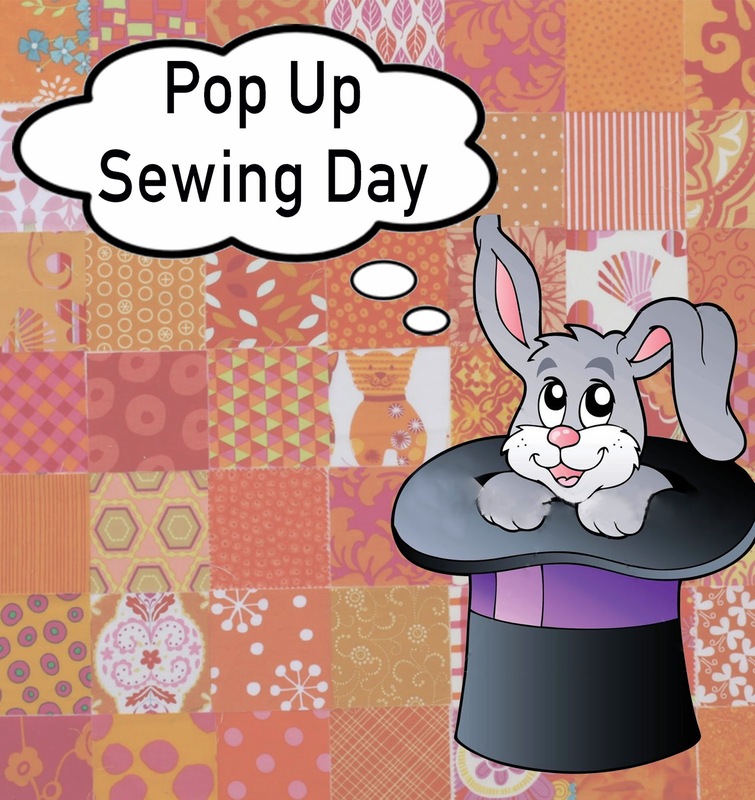 Not the Easter Bunny . . but you'd be a bunny to miss the next Pop-Up Sewing Day! 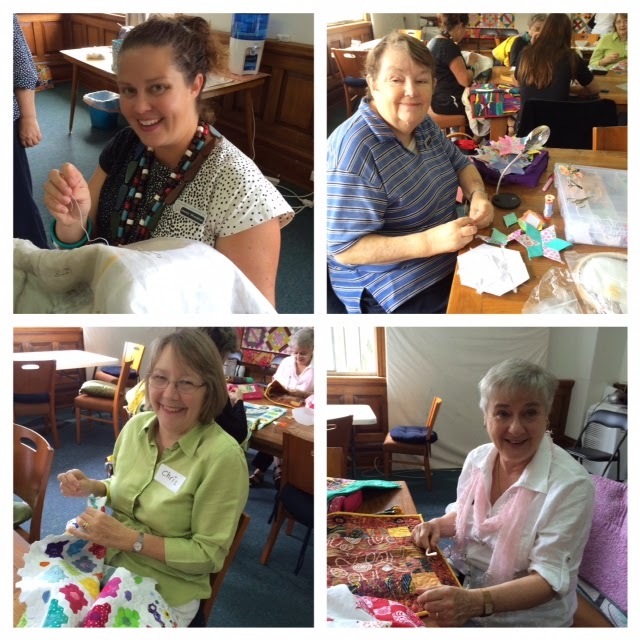 Hobbysew Top Ryde will co-host the next Pop-Up Sewing day with The Quilters' Guild of NSW Inc. Shoppers who usually patronise this store will already know that they are Australia's largest Quilting and Patchwork store, offering a vast array of fabric, accessories, sewing furniture and an in-store "Craft Cafe"
Members who attended the inaugural Pop-Up day a few weeks ago will have, no doubt, already registered for this next event through the Guild's Office, as there has been excellent feedback received by the committee. This month there will again be a Lucky Door prize and 10% discount offered on purchases. Numbers will probably be limited to 25, and at this month's event those who bring their machines will find plenty of room to set up, as the venue is large and light filled. The good thing to know is that ample parking is under cover, right at the door, so no need to transfer a sewing machine any distance. For those using public transport, take the lift to level 2 and follow the signs to Hobbysew. There are a number of buses to Top Ryde City Shopping centre and it is best to visit the Public Transport Information Website to plan your journey. The instore Hobbysew Craft Cafe has reasonably priced coffee, drinks, cakes & light lunches, however, members are welcome to bring their own lunch. Alternatively there are plenty of lunch options in the shopping centre. Members of The Quilters' Guild of NSW Inc who gathered at Quiltsmith last week for the inaugural Pop- up Sewing Day revelled in the convivial atmosphere that only a group of like minded quilters can fully understand and appreciate. Passers by may have heard many 'Ooh's and Ahh's' and a fair degree of laughter, emanating from the large workroom that Quiltsmith provided for the 10am - 3pm day of shared wisdoms, sewing and socialisation. 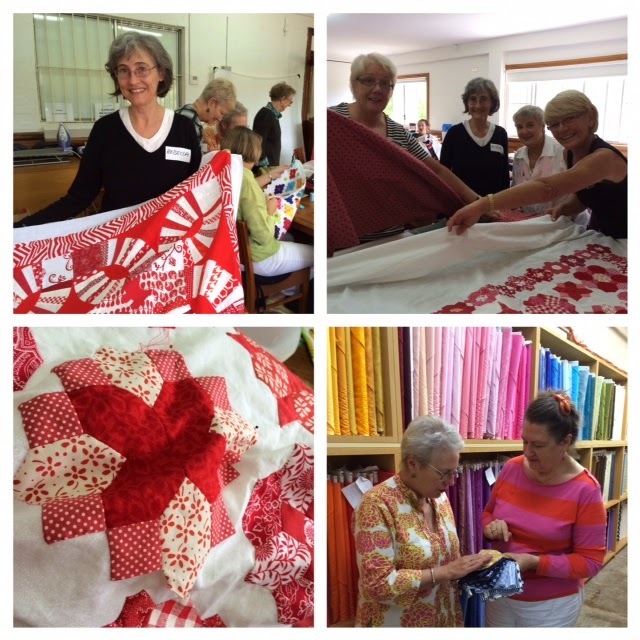 A number of participants were busily putting final touches to their Sydney Quilt Show entries, and it was a privilege to see in detail several of the 'Red and Whites' being created for this year's Challenge. Complimentary tea and coffee (and cakes) were much appreciated, and whilst there was a little good-humoured chiding about "it being rigged", the Lucky Door vouchers went to the very delighted Lynette T, and Salley G. There was absolutely no difficulty in 'cashing' these in, as Quiltsmith offers an extensive choice of glorious fabrics and sewing essentials. 4 members of the Management Committee also partook in the fun, and enjoyed talking to several younger members. If a member can't usually attend the Saturday 'Burwood Meetings' then these Pop-Up days will be a great way to feel part of the Guild. A big 'Thankyou' to the President Linda Butcher and her committee for organising this event, and to Melinda Smith and Quiltsmith staff for generously offering their premises, and friendly, fabric help . . .
everyone had such a lovely day! Members, please keep an eye on Template Free - 'the blog', for more information about the next Pop-up Sewing Day. It will be at Hobbysew, Top Ryde on Friday April 10th, 10am - 3 pm. A Booking can be made through the Guild Office, now, and again numbers will be limited. It's always enjoyable to see 'new faces' and new quilts, so do think about attending the next Pop-Up Sewing Day. Your attendance will be most welcome! If you have ever wanted to share your quilts internationally, the World Quilt Competition is a great opportunity to tour in the United States to quilt shows run by Mancuso Show Management. Accepted entries will premiere at the World Quilt Show – New England XIII (13-15 August 2015) and tour on to the Pennsylvania National Quilt Extravaganza, QuiltFest Oasis Palm Springs, the Pacific International Quilt Festival and possibly other venues from August 2015 through January 2016. Innovative & traditional entries compete for over US$10,000 in cash, prizes & awards including Best of World, Best Use of Colour, Best Traditional, Best Innovative, Best of Country & Viewer’s Choice. Entries can be submitted online, by e-mail or by post. The closing date for entries is 18 May 2015. 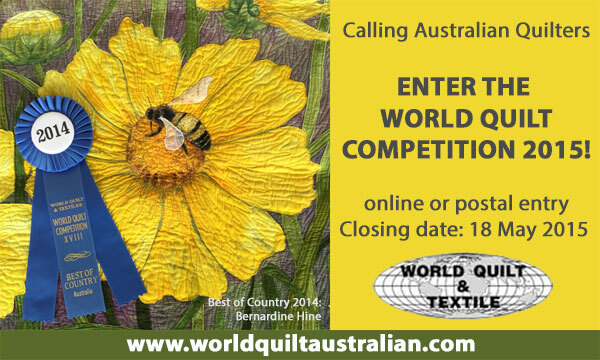 If you would like the World Quilt Australian Coordinator to collect your entry after the Sydney Quilt Show this year to send onto the World Quilt Competition, please sure to notify the Exhibition Secretary as soon as possible. The 'unsung hero' of quilting is often discovered at a Friday Showcase and Jan Foster is no exception. We all 'know' Jan, but as she lives in rural NSW, it is only her local quilt circle who may really be au fait with Jan's creative and technical finesse with a long arm. At the March Friday Showcase, city Members were able to observe in greater detail the superb results of Jan's meticulous and extraordinary quilting skills, accompanied by a self-deprecating, yet humorous expose of the artistic journey that has brought Jan to become a well respected and loved teacher on the Central Coast. In short, we were all gobsmacked by Jan's beautiful quilting. From her own whole cloth designs to 'edge-to-edge' to Custom work, Jan obviously treats each stitch in each pattern or repeat with care, and considered judgement. Thankyou Jan, for allowing us the privilege of being able to discover, touch and appreciate your lovely creations. The next Friday Showcase will be on Friday May 1st, in the Guild Office. All members are welcome to attend. Entry is $5, and bringing 'your own cup' is most appreciated. Up coming Quilt Exhibition : Armidale. The Quilters and Patchworkers of New England are putting the final stitches to their Annual Quilting Exhibition. Its not too late to plan a trip to this beautiful area of NSW, and with Autumn in full swing, the colours of this rural paradise will be visually uplifting, and stop-offs at local interest spots, wineries and eating venues, will keep the non-quilting visitors just as happy. Detail of 2015 Raffle quilt. 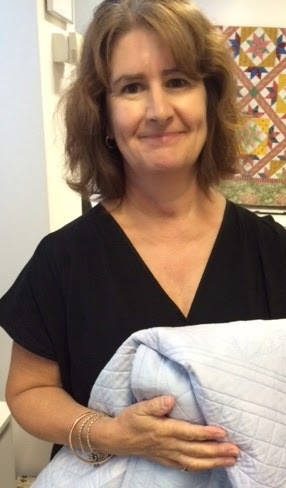 Robyn Wood, one of the organisers of the exhibition reports : "The Proceeds of our raffle quilt for 2015 will go to the Music Therapy Program run by the New England Conservatorium of Music. The program provides services to children from 18 months of age, to children making the transition to school, teenagers through to adults in their 60s with a variety of different needs, but mainly for those with autism spectrum disorder, dementia and acquired brain injury (through accident, drug or alcohol abuse). This area of NSW is 'home' to many quilters, so come and support their lovely exhibition this year. Venue : Legacy House, Faulkner Street, Armidale. Members attending last month's General Meeting at Burwood RSL were 'entertained' by the gifted and vibrant Guest speaker, Fiona Hammond. 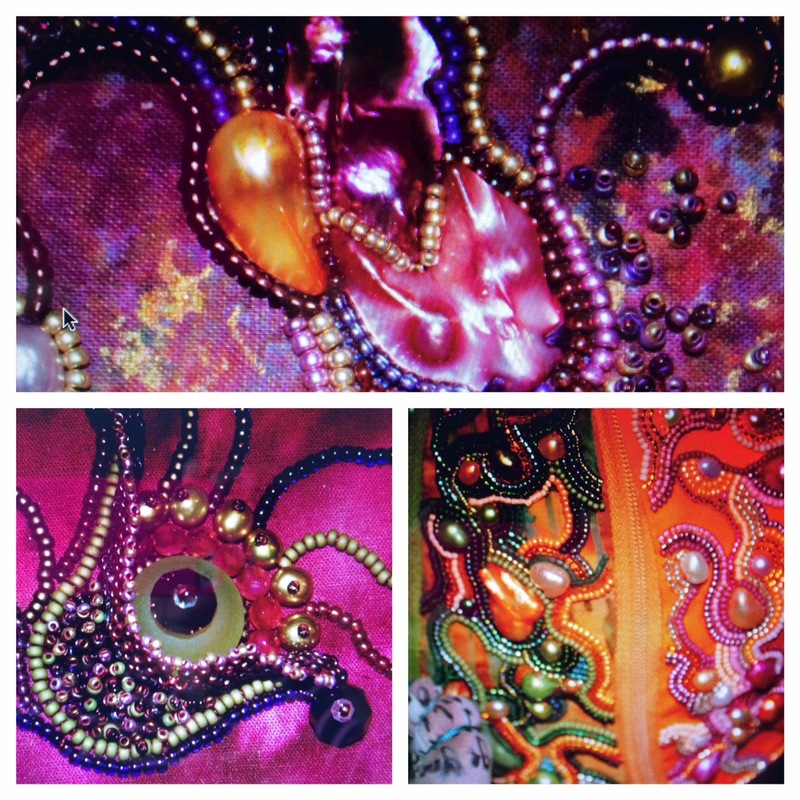 A colourful and visually inspiring slideshow of Fiona's textural and textile journey was accompanied by a hands on display of amazingly beaded and embellished jewellery, quilts, bowls and 3D fabric whimsy. 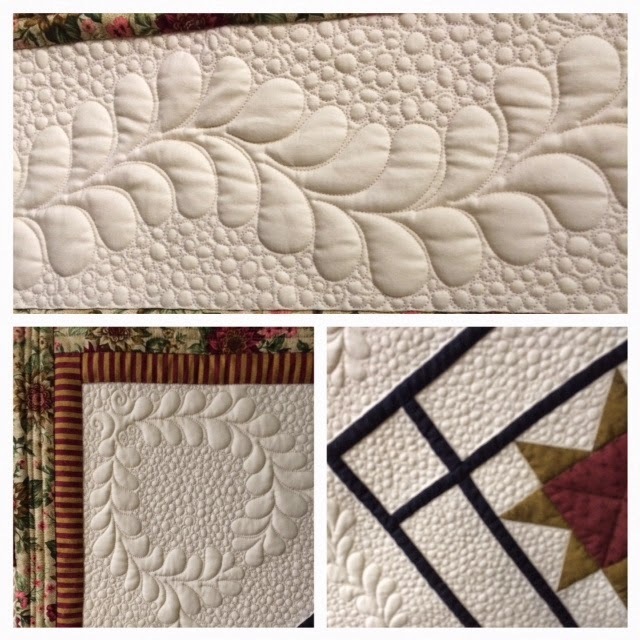 and, the "Demonstration" at the commencement of the day, was a timely and extremely worthwhile, instructional presentation by Deborah Laurie, guiding members through the new procedure of submitting their Sydney Quilt Show Entry online. The afternoon is always made even more colourful with "Show and Tell" and the first General Meeting 'back', in a New Year, consistantly produces a lovely array of quilts completed during the summer break. 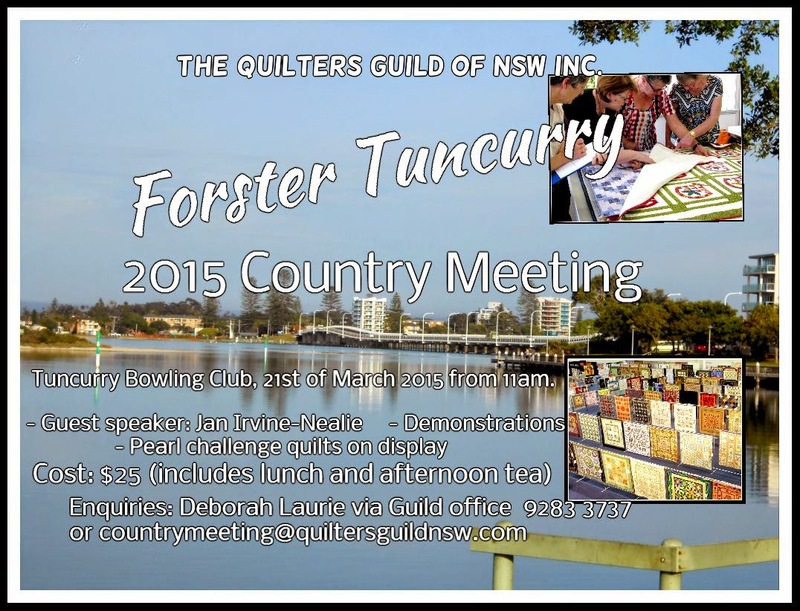 The next General Meeting of The Quilters' Guild of NSW Inc. will be the Country Meeting on Saturday 21st March, in Tuncurrry, where textile artist and quilter Jan Irvine-Nealie will be the Guest Speaker. The Big Red Barn at Wonga Park, will be the venue for a very special quilt exhibition. Wonga Park is a leafy outer suburb, approximately 1 hours drive from Melbourne Airport. 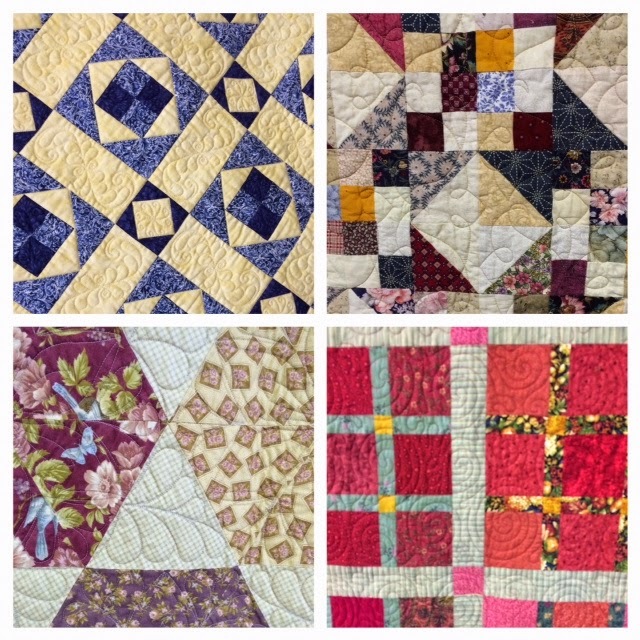 Highlighting the delightful quilts of Margaret Sampson-George, attendees will also be able to see many of the quilts created by Margaret's students from over the years. This extremely popular and gifted teacher has inspired a generation of quilters with her whimsical ideas and unique approach to quilt design. Her delightful manner and excellent teaching keeps aficionados coming back for more, year after year, and this exhibition is a culmination of hard work and dedication from the many quilters who have been fortunate enough to learn from Margaret. 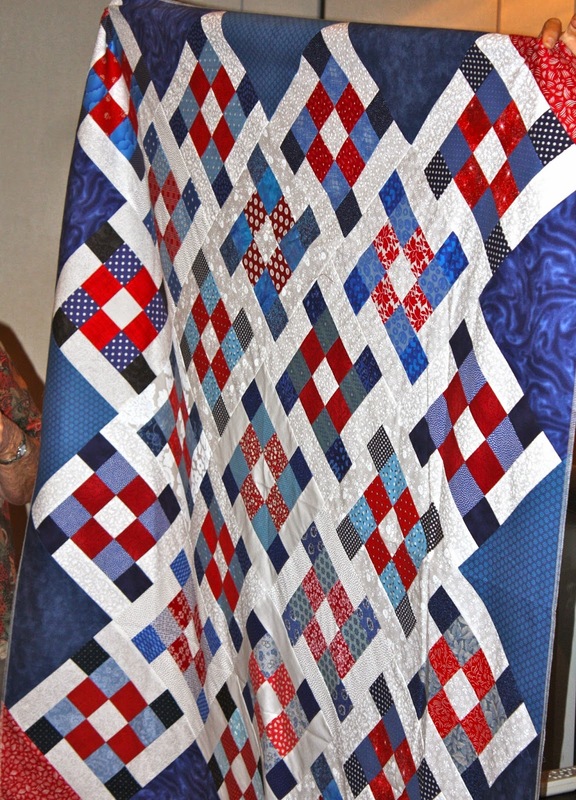 A Raffle showcasing the Quilt as detailed above, along with many runner-up fabric pack prizes. This event proudly supports beyondblue Hope. Recovery. Resilience. PS: Entries close on Friday 13 March 2015. Complete the Online Entry Form or Postal Entry Form today! The Craft Team at Expertise Events have informed The Quilters' Guild of NSW Inc. of an extension to the Due Date for the Mini Quilt Challenge "What ANZAC Means To You"
The Lest We Forget Quilt Challenge was first blogged in Template Free in November 2014. 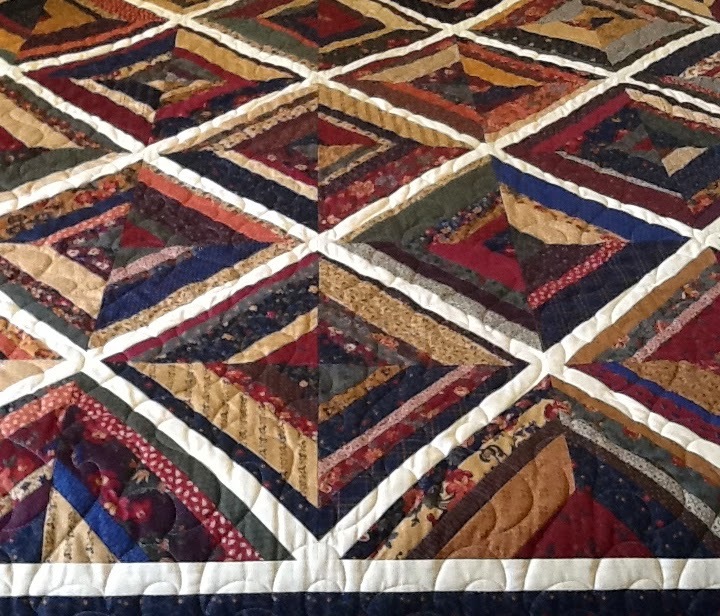 The New Deadline has been extended to Sunday March 15 for online entry and Quilt Image submission. There is still time to submit an entry as each entry need only be 25cm square! 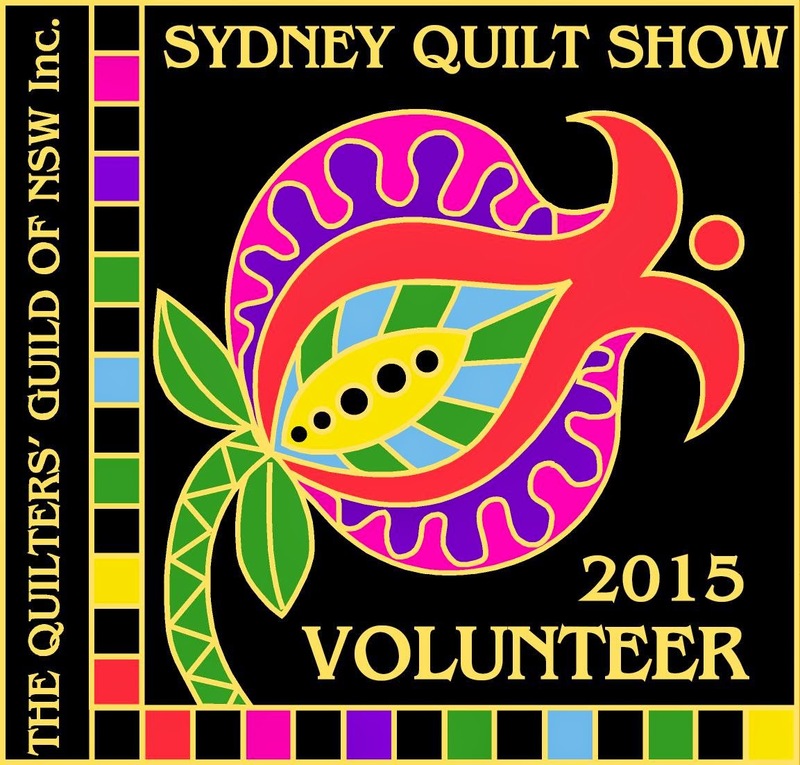 There is just ONE week until closing time for entries into this year's Sydney Quilt Show. Complete the Online Entry Form or Postal Entry Form today! All Volunteers will receive the Badge as illustrated : a very striking detail from this year's Raffle Quilt, designed and made by Helen Godden and her mother Pat Godden. Bundanoon is having a Birthday! Gazetted 150 years ago, the town has current locals working very hard to provide activities that help celebrate the history and heritage of this town - originally an area that provided a meeting place for the Wadi-Wadi and Gandagara peoples. Bundanoon is approximately 140km south west of Sydney : just 90 minutes of driving time. One of the highlights of the Bundanoon Celebration Calendar will be a needlecraft exhibition that pays homage to the creativity of residents since 1865. Advertised as "The Art of Needlework : Past and Present" this historic display has been curated by the members of 'Needles and Natter' a social needlecraft group, in collaboration with The Southern Highland Quilters Guild, the CWA, and local patchwork and machine sewing groups. Sponsored by the Bundanoon Community Association, this exhibition will showcase current needlework, historic Wedding Gowns, Christening Gowns, and other handmade apparel and useful domestic items, such as tablecloths etc. There will be a Sales Area, where the offloaded stash from other sewers can be purchased. So, with only a few weeks to go, please diarise this event and support the needleworkers of The Southern Highlands. Any attendees at a Friday Showcase over the past couple of years will instantly recognise our next presenter! Jan Foster is one of the delightful Showcase team who research and provide a diverse and interesting line up of Guest Quilters, entertaining all with their story telling and sharing of quilts, and now, Jan herself is in the spotlight! Many will also know Jan as a highly accomplished Longarm machine quilter who manages her business under the moniker Red Shed Quilting. This home service, originating from premises at the end of Jan's driveway, has now become a burgeoning business in a commercial outlet, offering sewing days, visiting tutors, domestic machine quilting lessons, and all the while still providing absolutely gorgeous custom quilting for a growing client list, who all appreciate Jan's creative, careful and extremely artistic eye and her courteous and joyful manner. Jan is sure provide many "oooh and ahhh" moments at the next Friday Showcase being presented by The Quilters'Guild of NSW Inc.